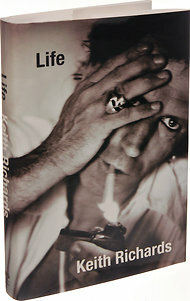 It took me a while to pick up a copy of Keith Richards’ much talked-about autobiography, Life (576 pages, with James Fox, Little, Brown and Company; $ 16.49 on Amazon.com, also available as an e-book). I’d heard many good things about it, but there were a few disturbing things that surfaced in earlier reviews, such as his disparaging comments on Mick Jagger’s personality and certain physical attributes. When I finally picked up the book, I half-expected to read a tale of years of addiction, rock and roll and a few personal anecdotes in the fashion of Eric Clapton’s own autobiography published a few years back. Instead, what I found was an eye-opening inside story about music and family. Yes, there are stories about Richards’ long addiction, but unlike Clapton, he doesn’t sound like someone hoping for anyone’s forgiveness. Instead, he simply the story from his own unabashed point of view and allows us pass judgment on our own. The narrative then takes us back to his youth in postwar England and his discovery of the blues. From then, he carries us through the Stones’ early days sharing a dirty flat in London, their sudden explosion in the music scene following Beatlemania and his process of composition with Mick Jagger. Throughout the story, he dispels various rumors created about his persona: no, he didn’t fall from a coconut tree in 2006, and neither did he receive a blood transfusion in order to kick heroin in the late 70s. And yes, he did snort a bit of his father’s ashes – something he recently confirmed in an interview with CBS news. Though he says many good things about Mick Jagger, he also reserves much vitriol towards the man he calls his ‘brother.’ For instance, he criticizes Jagger for trying to make the Stones sound ‘hip’ during the 80s and 90s, when he attempted to bring more contemporary sounds into the group instead of sticking to Richards’ preferred blues roots – which resulted in forcing Jagger and Richards them to share a songwriting credit with K.D. Lang on “Anybody Seen My Baby,” a track from the 1997 album Bridges to Babylon because its chorus sounded too close to Lang’s breakout hit “Constant Craving.” (Incidentally, the song is best remembered today for having featured a pre-fame Angelina Jolie on its music video). Also, Richards repeatedly accuses his bandmate of trying to seize control of the and also of pandering to the same elites and mainstream society Richards feels tried to destroy them in during the first decades of the Stones’ career. Life also has some wonderful first-person tidbits from Richards’ partner in crime, including saxophonist Bobby Keys, Marianne Faithfull, his son Marlon Richards and wife Patti Hansen, who tells a hilarious story about the time when she introduced her husband-to-be to her conservative Christian family on Staten Island, NY. I found Life a great read. Richards’ voice (the book was co-written with James Fox) is loud and clear, and it’s pretty amazing how much he remembers from over five decades of rock and roll – especially someone prone to excess as Richards admittedly was (and in a way, still is). Even if you are not a fan of The Rolling Stones, this is a highly recommended book for those interested in pop music history.